I’m way behind but was eager to participate in this. Last week Small Footprints encouraged us to eat vegan for a day. She wrote “Did you know that 1 in 3 Americans are at risk for developing kidney disease? And that our kidneys work 2-3 times harder when processing animal proteins? This week, for at least one full day, go vegan. This is always somewhat of a challenge for me because I struggle to maintain my weight, I’ve got a quick metabolism and I can’t eat nuts or seeds. Before, when I’ve eaten vegan for a day, I’ve got hungry and grumpy. Armed with this knowledge I decided to embrace the challenge by grazing, rather than having huge meals. Breakfast number one was six ryvita with mashed avocado, sliced carrots and apples. I get a bit texturally challenged, so the apple skin, which was a bit wrinkly, was saved for my smoothie. Throughout the morning I had a smoothie made from avocado, apple (plus two skins! ), frozen raspberries and frozen blueberries with soya milk. This is one of my favourites as you can see from the picture it’s extremely thick and creamy. I kept a bowl of diced avocado and beetroot with chickpeas which I ate with carrot sticks – I just dipped into this throughout the morning. I love how the beetroot colours everything pink! My ‘use it up!’ Green soup. This had the rest of the chickpeas, along with potatoes, kale, peas, leeks and garlic in it. Delicious! Like my smoothies, I tend to make my soups quite thick to keep me feeling fuller. I had another tower of ryvita with these and really missed the butter! I was hungry so wolfed down a bowl of porrage made with soya milk. It was at this point I really missed some natural yogurt with it. And I forgot to photograph it, but hey, it was just a regular old bowl full complete saucepan full, of porrage. 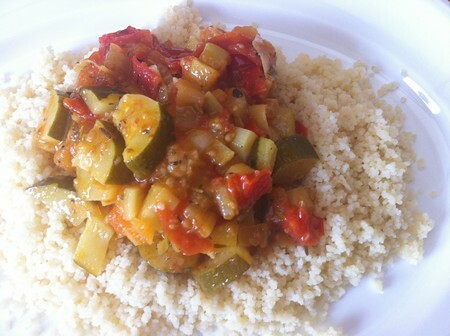 Cous cous and ratatouille. I was going to put tofu in this, but forgot, so put diced potatoes instead – it was a bit carb heavy, but I liked it! At the end of the day I felt pretty good. Yes I admit I could have eaten a delicious bowl of oats soaked in yogurt (one of my ‘go to’ comfort snacks) or a bowl of mashed potato with lashings of butter. But I wasn’t actually hungry and I enjoyed the way I felt after my meals – satisfied but not heavy. What about you? What is your favourite vegan recipe?